Phuket has way more happening than people realise, even as a local resident I find it hard to keep up. There are traditional festivals, there are music and food festivals, local street fairs, all kind of things going on year round! 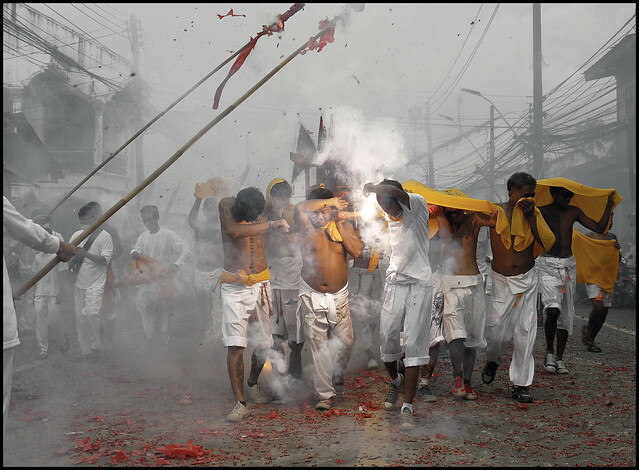 The most famous festival in Phuket is the Vegetarian Festival. Phuket is also a great place to be for Songkran (the "water throwing" festival / Thai New Year). Another popular festival is Loy Krathong. Dates for the vegetarian festival and Loy Krathong change every year as they are based on the lunar calendar. There is plenty of culture and history here, not just beaches! The vegetarian festival is my favourite thing in Phuket! The 2017 Phuket Vegetarian Festival was 19th - 29th October. But the festival was kept quiet as King Bhumibol's funeral was October 26th. Thailand's King passed away on October 13th 2016. And that was probably the biggest event in recent years. • Phuket Vegetarian Festival 2018 Schedule - I will update this to 2019 schedule well before the event - the date in 2019 is 28 September - 8 October. Note: Most of these are annual events, I don't go or blog them every year! 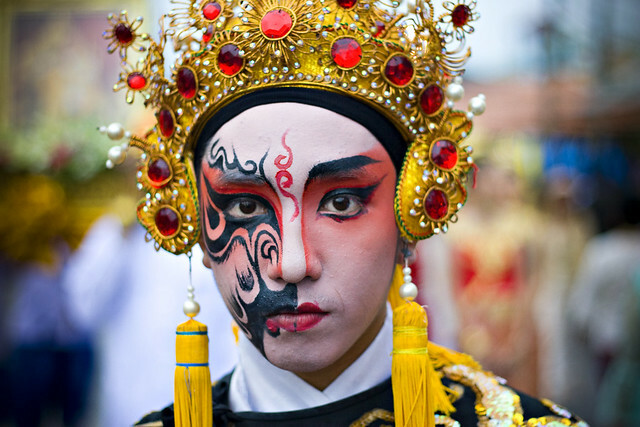 Phuket Vegetarian Festival - My favourite thing in Phuket! 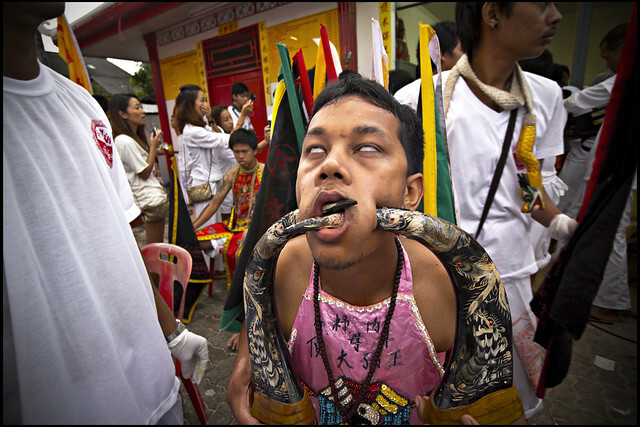 Links to all articles and photos on this blog related to the most bizarre festival in Phuket .. I love it, but it's not for everyone, and the "being vegetarian" aspect is just one part of the festival. Since 2006 I have always tried to see some of the ceremonies, take a lot of photos, and eat plenty of the great food on offer. I am not normally a veggie, but it can't hurt for a week or so!? My "local" is Kathu shrine, located in Baan Kathu. Sam Kong shrine is not too far from Tesco Lotus - loads of veggie food stalls in the Kathu/Sam Kong area during the festival. In Phuket town you find big shrines such as Jui Tui and Bang Neow which are very much the center of festivities. Phuket Town is the best place to be based if you want to see as much as possible. Songkran is the Thai New Year, a real mix of quiet prayer and water throwing mayhem. We tend to mix it up - a bit of quiet at the temple, a bit of water... on April 13th 2007 (apart from the water fights) we went to a turtle release ceremony at Mai Khao beach. The next year we drove around taking photos. In 2009 we reckoned both our kids were were ready for a ride in the back of a pick up truck around Patong, throwing water at anything that moved - that's fun! n 2010 I was too busy throwing water and drinking beer to take photos! In 2011 I was not in Phuket, but took lots of photos in my wife's home town, Chumphon (about 400km north of here). Last couple of years simply drinking beer and throwing water with some friends in Phuket! • Phuket Bike Week - 3 days of big bikes and beachside concerts, April every year just before Songkran. Every year, but dates vary according to the full moon. 2018 will be November 22nd. 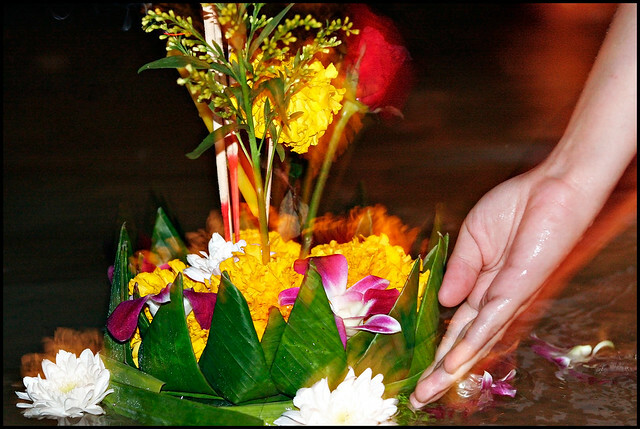 The main element of Loy Krathong is giving thanks to the goddess of water. The "Kratong" are floated onto the water and many lanterns are lit to float up into the sky. It's all about giving thanks and asking for good luck. There are a number of small local festivals in Phuket such as the Blues Festival, Patong Carnival, the Phuket Pride Festival... And events like sailing regattas and surfing competitions. Well, I hope over the years I'll have more time to visit some of these celebrations and get some photos! For updates about Phuket, follow me on Facebook and Twitter. See you in Phuket!